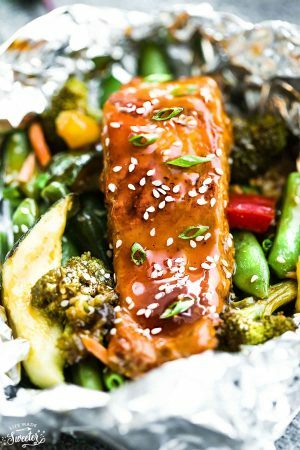 Chili Lime Salmon baked in foil on one sheet pan is fresh, flavorful and super delicious! Best of all, this recipe comes together in less than 30 minutes with tangy lime, chili powder and fresh parsley. The perfect weeknight meal! Plus recipe video! 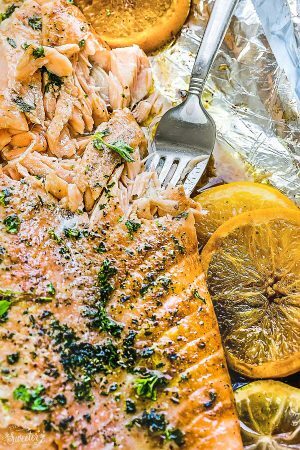 Slide lime slices underneath the salmon, wrap with foil (or use parchment paper) and bake until tender and flaky – about 12-15 minutes depending on the thickness of the salmon. To seal in the flavors, broil for 3-5 minutes until the ends of the salmon are slightly charred. Sprinkle with more fresh cilantro (or use parsley if you’re not a fan of cilantro) and serve with your favorite sides to make it a complete meal. Light, tasty and perfect for busy weeknights. 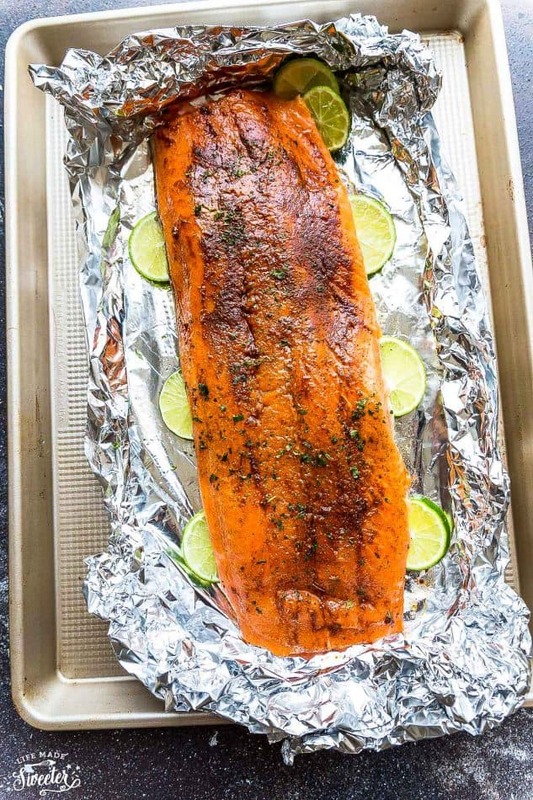 Chili Lime Salmon baked in foil on one sheet pan is fresh, flavorful and super delicious! Best of all, this recipe comes together in less than 30 minutes with tangy lime, chili powder and fresh parsley. The perfect weeknight meal! Preheat oven to 400 degrees F (see below for grilling**). 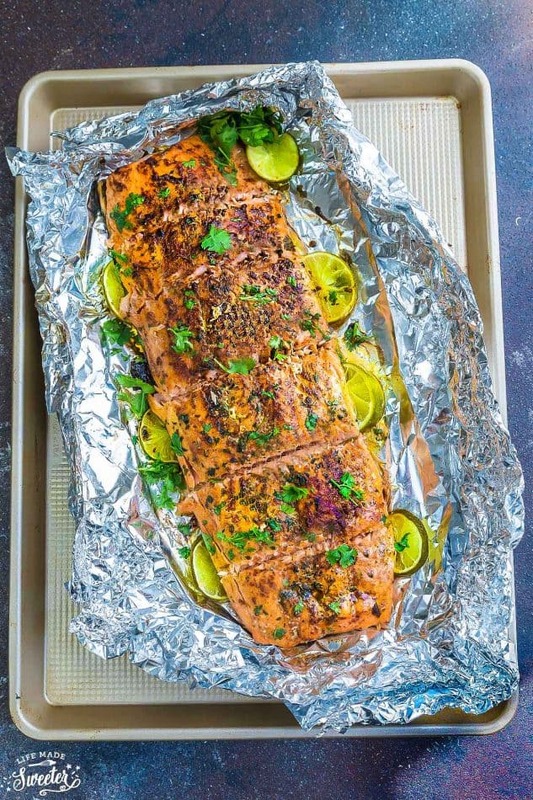 Line a baking sheet with a large sheet of parchment paper or heavy-duty aluminum foil. Lay salmon on top and drizzle with oil. Season with salt and pepper. Rub chili powder, smoked paprika and cumin on salmon and slide lime slices halfway underneath the salmon, as pictured. Bake in preheated oven for 13-16 minutes (depending on how large your fish is), or until the salmon is flaky to your desired doneness but try not overcook. 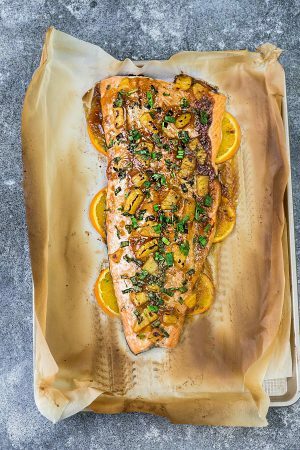 Unwrap the salmon, and turn oven to broil - cooking for an additional 3-5 minutes, or until caramelized and slightly charred. Cut into sections, discard skin and serve immediately with more chopped parsley, season with more salt (if needed) and a splash of lime juice. **To Grill the Salmon: Preheat grill to medium-high heat. 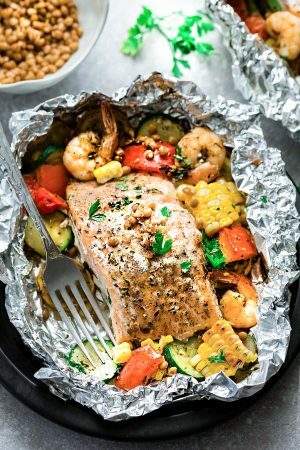 Line a baking sheet of heavy-duty aluminum foil, then place a slightly smaller sheet of parchment paper on top of the foil (optional if you prefer parchment paper). Place salmon on top and season as instructed above. 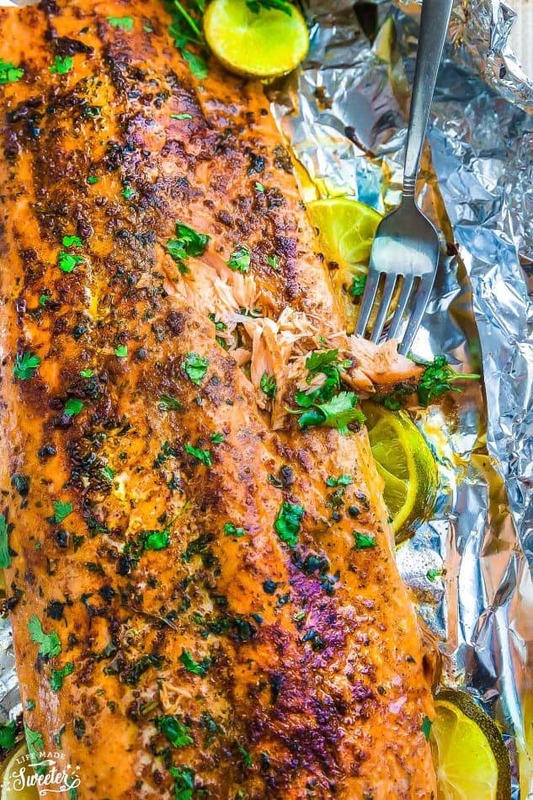 Seal up the salmon with the foil (and parchment) and place directly onto grill. 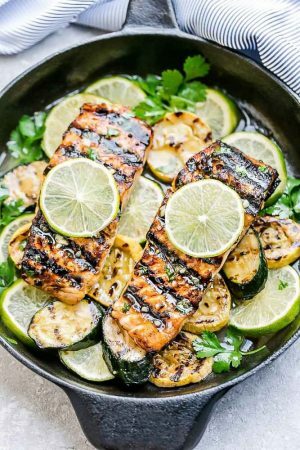 Grill for 5-6 minutes, then flip over and grill for an additional 3-4 minutes (depending on the thickness of the salmon) or until salmon is flaky. Remove from the grill and carefully open the foil packets. Cut into sections, discard skin and serve immediately with more chopped parsley, season with more salt (if needed) and a splash of lemon juice.